Either people have given up on their models or there is too much reputational risk. Now as silent as the grave. David Evans’ notch-delay solar model didn’t use the AP index, but predicts the super quiet sun will begin to make more impact on our climate about one cycle after the TSI started to fall (the fall occurred in about 2004, the current sunspot cycle is running about 13 years, so the fall will mostly likely start around 2017). The changes in the Ap index are a viable proxy for the wavelength/particle changes in the composition of the energy arriving from the sun which then has an effect on the ozone creation/destruction balances above equator and poles as per my New Climate Model. In so far as charged particles are involved, the magnetic field brings them in preferentially above the poles which causes some of the difference in the ozone response above equator and poles as described in my main article. I would expect the continuing low Ap index to result in continuing expanded polar vortices at the surface, more meridional jets, more global cloudiness and slowly falling amounts of solar energy entering the oceans. Thus the fall in Ap noted by David Archibald could have been an indirect cause of the recent El Nino proving to be very weak as compared to alarmist expectations. WUWT has been running a series on the subject. It was Anthony who I think first commented on the sudden drop in ap in Oct of that year. A post and lots of comments at WUWT on Jan. 4, 2012. Also, I recall that Ap is not accurate at low values. Aa index might be a better choice. I’m just reporting — don’t quote me. The earliest WUWT I see is http://wattsupwiththat.com/2008/08/30/the-sun-remains-in-a-magnetic-funk/ . I refers to another post a few months before, but I don’t see at http://home.comcast.net/~ewerme/wuwt/cat_solar.html . The 8/30 post is the one I remember. At the time I figured it would perk up when we got some sunspots as SC 24 got rolling. Guess not. I really despair about current climate “scientists” employed by various government bodies. They appear to completely lack knowledge of the basics in their field. As I keep saying (and being marked down by the trolls) we know the sun has gone quiet 5 times in the last 1,000 years. We have C14, and more reliably Be10, figures to show these quiet periods, along with C18/C16 isotope ratios for temperature. Each time the sun has gone quiet the Earth has cooled. We even have some thermometer measurements during the last two events (Maunder and Dalton) as well as a mass of documents corroborating the colder conditions. Jack Eddy published his well known paper in 1976 in Nature, but current graduates don’t seem to have heard of it. But he was an astronomer and well aware that the sun was a variable star. The current lot are obsessed with carbon dioxide and discarded all other possible explanations for any temperature change, so the approach of a refutation of their theory leaves them behaving like a mouse confronted by a snake, scared and immobile. While government funded “science” has been off trying to blame CO2 for driving the climate, even while evidence would indicate it does nothing of the sort, we have made no progress for a generation trying to understand how the planet’s climate really works. It is a travesty. including evaporation, rain, snow, and ice, that regulates alteration of the atmospheric gradient from dry to humid. I have a book published in 1975 (predicting cooling, but the scientist switched to global warming by 1983) which roughly backs Stephen Wilde’s theory. It mentions variable solar output leading to migration of climate zones to higher or lower latitudes, without any mechanism. This seems to have been understood meteorology at the time, and has the advantage of explaining why the Sahara was green and well watered 7-9000 years ago, and other variations. The authors were more interested in changes in rainfall than temperature, and found their answer there. It would seem that anything written before the start of the internet is not of interest to climate “scientists”. Perhaps that is why so many physicists and astronomers are sceptical about AGW. (Geologists, chemists, engineers, statisticians and others are rendered sceptical by other outlandish claims). Graeme No3, Engineers who have qualifications and experience in thermodynamics and heat & mass transfer know that the AGW hypotheses are wrong. They are not skeptical they just understand facts. I do want to be labeled other than a professional engineer who is competent in his field. One wonders how many professional engineers sign off on the deisgn of e.g. wind turbines structures, without understanding their dynamic behaviour. How do they cover their backsides? Maybe that’s why I can’t afford professional liability insurance. Bernd, I know you mean well. Surely those who build structures that fail are either not professional engineers or not competent. I deal in facts from my experience. However, if one calls belief in Gaia (Flannery) and wicked humans a religion with “climate scientist” adherents or believers then by the definition I would have to be called a sceptic. “The current lot” come from a very different background to scientists of the past. “Climate Science” is a magnet to people who start from a “moral/ethical” viewpoint and who are essentially evangelists and activists. I know one young guy, very nice and extremely talented person, who I overheard talking about “carbon pollution”. He is an ecologist who works in the area of mine site rehabilitation which is fair enough, something to be valued in fact, but “carbon pollution”? From some one who knows precisely that all life on the planet is carbon based? What sort of crazed, misanthropic, self loathing is that about? Well, sort of. Cog dis is actually the uncomfortable result of holding opinions or theories contradicted by observation, it is not the contradiction itself. Way beyond my area of expertise, but I am curious. How do we know that the sun had “gone quiet 5 times in the last 1,000 years”. What is the objective evidence? Can you provide any links I can read up on the subject? … and find the paper linked to above. Note that the author and the person, mentioned in this post above, usually do not have high regard for one another’s views (my interpretation). Regardless of that, there are many papers on the site for you to look at. Thanks John, I will read these over the next couple of days. The most direct verification of solar-activity reconstruction is a comparison with the actual GSN sunspot data for the last few centuries. However, regression-based models (see Section 3.5.1) cannot be tested in this way, since it would require a long set of independent direct data outside the “training” interval. It is usual to include all available data into the “training” period to increase the statistics of the regression, which rules out the possibility of testing the model. On the other hand, such a comparison to the actual GSN since 1610 can be regarded as a direct test for a physics-based model since it does not include phenomenological links over the same time interval. The period of the last four centuries is pretty good for testing purposes since it includes the whole range of solar activity levels from the nearly spotless Maunder minimum to the modern period of a very active sun…..
Introduction to solar variation – probably more than you want to know (or is that useful). which should bring up links to articles with useful graphs. Everything that’s supported by government evolves into a sheltered workshop. I can’t find a 1976 Nature paper by Eddy. Do you mean the 1976 paper in Science? that is the one. I should have remembered that Nature doesn’t like that sort of thing. It indicates an unusual solar activity but how it will pan out? The cooling in the 70″s is overdone in comparison with the warming in the 30′s. I am banking more on the reduced output of the UV. If the outcome does turn out to be longer-term cooling, as some are proposing, I wonder how the spin doctors will play this out? I’ll bet the major players are already working on their spin, just in case. Or they’ll just fall back on their worn out statement of ‘The climate models predicted this.’; nothing to see here, move on (and send money). A few days ago on ABC Radio National local radio I heard part of a conversation with an economist from the UK, he claimed that Australia has been experiencing higher rainfall because of global warming??? Strange, not long ago we were told that warming would result in lower rainfall, no water to fill our dams (Flannery and others claim). The economist also claimed that warming continues to rise. The propaganda continues …..
bemused, I think the global warming propaganda might go something like this. ‘We warned you that global warming was nearing a tipping point, and we were right, excess CO2 caused global warming to cross the tipping point to produce global cooling. The only thing mankind can do to save the planet is make drastic cuts in CO2 to reverse the process and get us back to warming. And, there must be world-wide acceptance policed by the UN this time. Finally, we need to spend 100s of $billions more on research for policies to bring about this universal acceptance of the harmful effects of CO2′. Blah, Blah, …..
Dennis,sadly I think that you are right and your statement will turn out to be prophetic. It’s the only path open to them,they won’t come out and say that “they were wrong”,those are the words that won’t cross a scientists lips. for what me might call “ peak heat “ of the millennial trend in about 2003. The RSS satellite data provides a consistent record of relative temperature trends since 1979. The non satellite data has been homogenized, reanalyzed and changed by adjustment algorithms so as to be highly suspect. shows that the earth is entering a cooling trend which will possibly last for 600 years. Who put the hype into hyperbowl hyperbole? “The fire in the heavens that sears us now is all our own work. Global warming shrouds the great celestial motif of human existence. The sun, hitherto the source of all life, is now darkened by the threat of unmediated potency. Last time there was such a quiet sun (cycle 14?) there was a whole bunch of bad weather and climate anomalies, different to the ones now. But that’s okay, because nobody can find a cycle without a whole bunch of bad weather and climate anomalies. Just like nobody can name an era when the climate was any nicer than now. (I do prefer it when the PDO stays neg, but that’s just me.) If they’re actually going to control climate or dial us back to an old regime through taxation and regulation, I’d suggest avoiding any known decade or century and just starting fresh. They’ve all been trouble. Californians really should avoid the Middle Ages while Chinese should avoid the centuries following. I suppose there are real estate possibilities. If the Poms don’t like their present coastline they should dial in the first century AD. When the Romans invaded they could sail right up to Richborough. Now it’s a hike. My only certainty after observing solar cycles and actual climate change is that electricity is my best bud…and coal makes just the best electricity. The weak El Nino is not good news for Peter Wadhams and AMEG. He was relying on a strong El Nino in 2014/2015 to finally clear the Arctic ice. 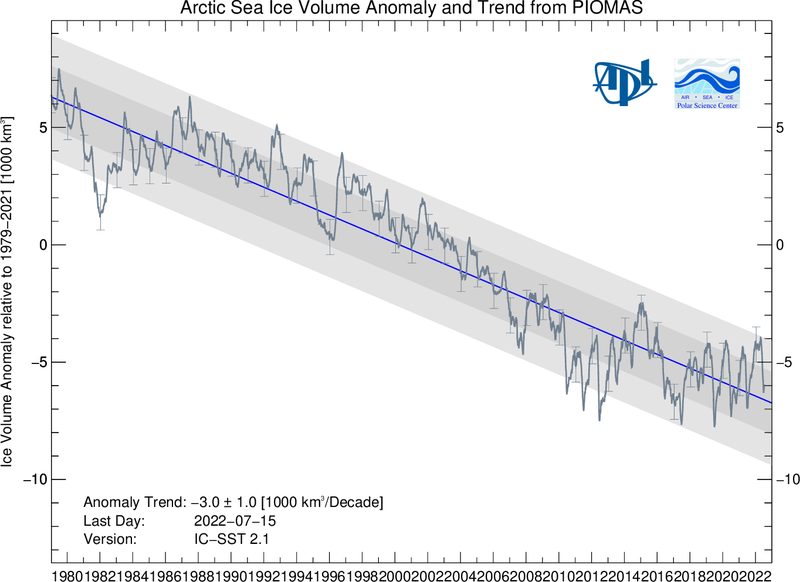 That means Peter Wadhams’ simple trending now puts 2020 as the year of Arctic being ice free rather than 2015; as he predicted in 2013. With SC24 activity now finally in decline 2020 is more likely to be very cold. Extent and volume of Arctic ice seems the last clearly visible foothold for evidence of global warming. Once it reaches record levels for modern recording surely it will be apparent that simplistic climate models based on data correlations from 1970 to 1990 are WRONG. There are numerous forecasts about SC25 being unusual! Now that SC24 has had its second peak, forecasts for SC25 might be in the pipeline. Is the trend line to a new Little Ice Age still indicating 2040 as the start year? Obviously we are going to experience colder conditions between now and then. I will be fascinated to hear the spin doctors explaining why. In the Arctic ice death spiral the black line for September that grabs your attention is a forecast for 2013. At is is for August. The forecast proved wrong. I have not seen updates that correct this or any death spiral that shows 2014 data as it is no longer a death spiral. The recent trend in ice volume taking averages from 2010 to 2014 forecasts the globe to be covered in ice by 2200. Improbable but it does demonstrate what can be done with trend lines. It will be “building up to catastrophic warming” and as they all freeze their narrow butts off, they will no doubt continue to wallow in their own delusions of grandeur regarding “settled science” and certainty. I ain’t no spin doctor at any level but lets have a try. Currently and during the recent past we have experienced a period of “temperature inflation”. Temperature inflation is similar to monetary inflation . You still as an individual have the same amount of “degrees temperature” supply available but due to the climate organisations boosting of “degrees temperature” supply we can’t buy as much “heat” as previously for the same “degrees temperature”. As a constant temperature or worse, “temperature deflation” would lead to predictions of a colder world it is in the interests of the promoting and boosting the concept of less energy use and therefore the conserving of the earth’s scarce energy resources, it is essential that a moderate inflation of temperature units be maintained. The fact that ice would melt at 10C under such a temperature inflation scenario such as we are currently experiencing is merely a function of maintaining the required levels of temperature inflation so as to conserve energy resources and prevent any increases in the public perceptions of falling global temperatures and therefore a retreat from a future climate catastrophe due to rising carbon levels. The effect of the angular momentum of the Sun and all the planets is shown here. In the above linked website (being visited by over 100 each day) you will see a plot derived from planetary orbits. There is a very strong correlation between world temperature data and the 934-year and superimposed 60-year cycles in this plot. I postulate that magnetic fields from the planets affect the Sun and cosmic ray intensities, and the latter can affect cloud formation and thus climate on Earth. Why don’t you just read the detailed info on the website? It will blow your mind. I guarantee you will not be able to find a physicist who can prove it wrong. Over 1700 have read the site in the first week or so. Physicists have confirmed it correct. I am working towards large scale class action against the Australian government, because the physics I present is right and IPCC explanations are not. I don’t know why you’re not interested. The only thing mind blowing is your lack of understanding of the main graph (scalar sum of AM)used in your book and website as one of the main pieces of evidence of a 934 year solar and climate cycle. The author of the graph himself (P.A. Semi) questions the validity of using a scalar AM sum in his non peer reviewed paper, so your evidence is extremely weak. Rather, you have grabbed onto a graph as it suited your needs without understanding the basics. When looking out over the Holocene there is no 934 or 1000 year cycle in the solar proxy or earth temperature record….end of story. Your comment proves you have not read the book, as it does not contain that graph or even mention angular momentum anywhere in the text. There is nothing to say the exact length of the 934 year cycle might not have varied thousands of years back, possibly due to variations in solar eccentricity that are fairly likely to be the regulator of glacial periods. I don’t care about the author’s feelings on the matter, which may have been expressed that way due to peer pressure. It is blatantly obvious that the 60 year cycle is there in both the climate records and that plot of angular momentum. You can also see the 60 year cycle in the graphic in the Appendix of my peer-reviewed paper “Radiated Energy and the Second Law of Thermodynamics” published on a few websites in March 2012. Whatever the cause of temperature changes for Earth’s surface, it has nothing to do with carbon dioxide, the reasons for which are explained in the linked website – reasons which you avoid discussing, I note, perhaps because of a lack of understanding of thermodynamics on your part? So you are ready to drop your misleading scalar sum AM graph from your website? 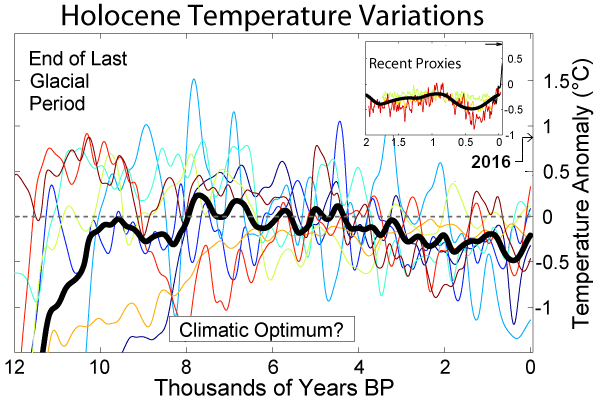 I have no problem with 60 ocean cycles or laws of thermodynamics, but trying to establish a 934/1000 year solar or temperature cycle across the Holocene is blatantly wrong, as anyone can see looking at the Holocene proxy records. the climate shapers and climate wizards of what were the greatest intellectual power houses of mankind who can take a mere speck of climate data and turn it into a planetary catastrophe. Oh how they have fallen. Slightly OT, but I’m not sure if people have seen this: http://scitechdaily.com/study-identifies-fossil-fuels-must-remain-ground-limit-global-warming/. New research led by the University College London shows that a third of oil reserves, half of gas reserves and over 80% of current coal reserves globally should remain in the ground and not be used before 2050 if global warming is to stay below the 2°C target agreed by policy makers. Yeah last thread, its just laughable garbage isn’t it. “New research led by the University College London shows that a third of oil reserves, half of gas reserves and over 80% of current coal reserves globally should will remain in the ground and not be used before 2050 if global warming is to stay below the 2°C target agreed by policy makers”. Just for starters the USA alone and not counting the rest of the global land surface which is about 6.15% of the global land surface area, now thinks that it has at least 200 years worth of shale and conventional oil under it at the USA’s current rate of consumption. Now if the rest of that say 85% of the global land surface, if we leave Antarctica out, has even only 50% of the shale oil resources per land area as the USA has then little but pure ignorance of the recent increases in fossil fuel resources makes that University College claim seemingly based on ia complete ignorance of the currently available resources, rather dated to be very polite. And haven’t those ignorant academic intellectuals of the University college ever heard of technological progress and the research into new fission and fusion technologies that will most likely make the use of fossil fuels a very small component of energy use by 2100 and mankind will most likely be well down that road in that direction by 2050 anyhow. Its quite astonishing that these academics who are paid very princely tax payer funded stipends to look into and develop technologies for humanity’s future seem to be so fixated in their belief that nothing is going to change at all in energy sources and use for the rest of this century. And on that ignorance and intellectually constrained inability to even contemplate the possibilities of energy generation technological advances into the future and of new energy sources, they base their entire claims and predictions on what is current and in my opinion rather ignorantly extend those claims into a totally unknown future that in some cases are at least a century ahead. Unfortunately, these same people and their supporters are basically against power sources such as nuclear or even hydro; only wind and solar will do for them. Were it so simple as to provide these people with their wishes, so that they could experience what it means to live by the wind and sun alone, I think they’d rapidly change their tune. later and see how they go during the interim. Much screaming and whinging no doubt. solar and wind power. I’d even help them move. Or, the people that want it, move to a place that only has solar and wind power. The really sneaky thing about that is all those wind and solar plants are all just connected to the overall grid. So, it gives the impression that both of those renewables are in fact just adding to the overall total power consumed, so they actually seem that they are a part of that 24/7/365 power supply for consumption. Until people actually become aware that wind and solar power cannot supply power on the scale required, and of more importance, on the time required, then renewable power will always have that ability to create the illusion that they can supply that level of power, something they will never do. Yeah Tony, I agree totally. is all they have. NO connection to the main grid. AND, don’t let them back. I travel interstate and intrastate by road regularly and the number of privately owned solar “farms” are like weeds growing, there can only be one reason and that is subsidies creating a Return On Investment at the expense of electricity consumers. Even better INSTALL SMART METERS (as recommended by all green loons) but set them to supply only renewable energy when it is available. I have both off-grid and grid connected solar systems. Living in Melbourne with current component prices, bank TD rates (my cost of capital), service fees and power costs it works out economic to go off grid for new installations. The most economic solution includes a small generator to pump up the system for the 15 or so overcast days during June and July. This is without subsidies but requires competitive installation cost. The on-grid system has been operating for a number of years and was installed with subsidies and enjoys ridiculously generous feed-in-tariff but I am not complaining. It is my reward for doing the financial analysis when the opportunity presented. Lithium batteries are the game changer. Not many people have done the economic analysis. There are a few lithium batteries now being installed by grid operators to manage peak loads. They are economic for this support on the network but make more sense to be distributed into households and fed directly from solar panels on the roof or a small generator when there are long periods of low sunshine. I have worked across the full range of electric power production from coal face to distribution. My mind boggles at the simplicity of sticking a few solar panels on the roof, battery in the garage and then free power for a lifetime thereafter. Only if WE all help subsidise YOUR choices. nah… not going to happen !!! Its just another Greenie ‘GIMME’ . My off-grid system is completely unsubsidised. In the context of my high FIT on my grid-connected system my off-grid expenditure has a payback within 7 years due to increased exported power but if I went completely off-grid the investment would still have a payback compared with the 4.3% I can get on term deposits. Anyone with savings and some technical interest can make a good investment in off-grid solar WITHOUT ANY GOVERNMENT SUBSIDY. Solar panels are still falling in price and gaining in efficiency while lithium batteries are not yet mature technology with forecasts of significant cost reductions. These developments are similar to what has happened with flat panel TVs, mobile phones and computers. Stand alone solar is a game changer for household energy self-sufficiency in Australia. There are few places in the developed world that enjoy the sunshine that most of Australia experiences. On the other side of the equation, electricity and gas prices in Australia continue to increase. The only downside I see for households with investment in off-grid solar is that it reduces all the exchanges and hence tax revenue of the existing supply system so the investment is subject to sovereign risk as governments find ways to tax sunshine or tax via other means such as increased land tax. Japan has already achieved pilot production on a near ocean resource that could make it self-sufficient for NG for at least a decade. A good statement – except the timing. By 2050 the technological ability may be known and tested. However, the currently built structures and the one’s being built this year and next will not just be scrapped. To do so would be a colossal waste, several orders of magnitude worse than the USA’s Cash for Clunkers program. I can agree that by 2100 new structures will be filling the energy needs in many ways. Liken this to the use of cell phones in places that never had phones. Meanwhile, I still have a plain old telephone system (POTS) reaching my house via copper wire. Pretty easy to identify solar physicists from climate modelling alarmists then. The latter being unconcerned with trivial matters such as whackily inaccurate models and loss of reputation. All I an say is it looks like it might be wise to stock up on tinned food and woollen socks. Here is an interesting study that i just happened to have lying around. coefficient (R=0.05) between corrected global surface temperature data by removing the solar effect and CO2 concentration during 1850-1970.
and global climate change but have superior predictive capabilities, compared with the conventional models. Do you ever get the feeling that there is a tad too many scientists? Ceakar24. I agree that poor level of training of scientists. But there are several other causes that be equally, or more, important. 1) Consider that almost all of the government funded science in climate is junk science. It is a vicious cycle, government leaders and bureaucrats become more cowardly, more inflexible, and more self serving day by day and they will not support that does not support the political views of their leaders, 3) Climate science used to be mostly done by climatologists and meteorologists but more and more funding is going into the pseudo-sciences such as psychologists, social planners, and other people not trained in climatology but trained in political methods, and 4) a totally biased, radical leftist media and academic establishments ready to respond as toadies to their political leaders, and 5) a less educated and more poorly educated society. Good list Leonard, well done. Interesting position – man made global warming is/was real, but wasn’t due to CO2. And to combat cooling, pump more CFC’s into the air. That alone should get him beaten up by the Skeptical Science mob. Of course it is based on a computer model using databases of global surface temperatures ?????? and I am not sure that he has accurate figures on the amount of CFC’s used either. Agree Graeme all studies that rely on incomplete data coupled to a software program should be treated with caution from the concept is interesting. I have read other studies that suggest a quiet sun = lower UV = weak ferrell/polar cell boundaries causing the “polar vortex” to push closer to the equator (at both ends). This is achieved via a warming in the upper stratosphere as there “should” be more Ozone. Regardless of where the truth lies any scientist that continues to ignore solar effects…………..
ah, so now we can say the montreal protocol successfully saved us from catastrophic warming. but now how do they make us cry for them to tax our breath? The modest much-precedented warming on Earth c. 1975 – c. 2000 had nothing to do with the Sun and the same applies to recent warming observed on Mars Pluto Triton and Jupiter (ref. Heaven and Earth by Ian Plimer) according to 97% of climate scientists — so there! P.Gosselin of the German NoTricksZone blog is on a roll when it comes to the german DWD weather service’s switching from LIG thermometers to the electronic temperature measuring systems. Somebody forgot to put the coins in the meter! So we don’t understand solar activity either? Nor El Nino or La Nina. The Hot Spot is completely missing. Global temperatures have not changed for nearly two decades. Hurricane activity is going down, not up. Freezing winters in the Norther Hemisphere. Rain in Queensland. Another miserable year of irrelevance and dropping orders for windmills? The Lima conference famous only for defacing the National heritage of Peru. Is there any good news at all for warmists and the Greens, apart from the public support of Barack Obama and John Kerry. In Australia the Green parties are very quiet in face of Islamic terror by their friendly muslim extremists, also haters of Israel and Jews. Tim Flannery is still hoping for his ‘angry summer’ while Australia gets record rainfall, a year’s rainfall in a day in some places and rain at last in parched Queensland. We are between droughts and there is just no good news. He continues to say that assuming such cycles in models can create artificial results. He also says that the problems arise through the use of the inaccurate PMOD or ACRIM data rather than the more accurate RMIB data. The question I have is how would using the RMIB data affect your model, especially your as yet unidentified mechanism for the 11 year lag? How does your model perform if you replace the TSI cycle with one reflecting peak spectral changes, either directly or using ozone formation as the proxy? Actually knowledge is accumulating quite quickly. Existing theories about drivers of Climate Change are being disproved by the twists and turns of the Natural Experiment. The Green House Theory is all but dead. The lack of warming over the past 18-25 years shows that CO2 is not a driver of Climate Change. If the low sun spot activity continues we should soon see if the Solar theories are correct. If they are correct then global cooling should become evident within a few years. So far the UAH temperatures remain above the median line. Scientifically that is true, but we still have a huge task convincing the masses. What’s needed is an alternative weather channel to present reality. The political Warmists and Klimatariat would see it as heresy, while the person in the street will laugh out loud at what appears to be satire. Assuming we are correct and cooling begins in a few years, then there should be signs in the run-up …. to be exploited. Oh for sure, its the White House theory these days, maybe it always was. There are signs that cooling has already started. However it may not be clear for a few years. Up till now it has been called “the Pause” or “the hiatus”. These terms reflect a prejudice or belief that warming will continue. The heat must be stored somewhere, about to pop out and warm things with renewed and increased ferocity. I think that we will begin to see the pause as the peak, but time will tell. Indeed, this Modern Climate Optimum plateau cannot last forever. Just looking at BoMs prediction for January to March and they failed to see the rain. In south-east NSW the farmers and graziers are enjoying a bountiful summer. And here is BoM backtracking. Perhaps the Greenhouse Only Theory? The Greenhouse idea was an interesting observation but changed into an entire theory of Global Warming as it and it alone was dependent on CO2 and CO2 was the target. CO2 growth represented the advances of Western civilization in the 20th century in cheap energy and the consumer society. Of course that presumed that CO2 growth was due to fossil fuels, something no one bothered to prove. Goodness, that could make things a bit chilly-willy. Lucky we’ve got all this Global Warming to keep us comfortable. All solar scientist is quiet. Well, should be as they almost know nothing what happens under the surface. Predictions seem to be just guesses based on previous behavior. This works maybe good in linear systems, and may work a number of times due to luck. But as predictions or models working on chaos, no. What’s far under the surface on the sun is said to take 100.000 years to go from the center to the surface due to the high density. We can see currents on the surface and still make guesses whats coming below, but that’s far from knowledge. So, when the AP index suddenly goes quiet it’s a surprise for everyone. Hm, I guess no one really know what’s ahead. Speculation goes from global warming to next ice age. I am afraid it might be cooling around the corner but wish for some warming. That’s way better for humans. So any way to work against a little warming has to be bad whatever the reason. Any government who can’t see this should not be qualified to govern anyone. So it’s currently cool to predict cooling? I have done so since November 2013. However the comment by Rolf above is unfortunately correct. All the predictions depend on assumptions of future solar activity, and we don’t really know for sure how that works or The Hidden State of the Sun. Just because a model fits temperature history quite well so far does not mean its predictions of the future can be believed, since they depend on known unknowns and unknown unknowns. I know what it would take to change my mind about reduced solar activity creating cooling, so I can be properly skeptical about it. By 2022 I will know if I’m completely wrong about the influence of solar activity on climate, relative to CO2. However I won’t know if my estimate of the Svensmark effect is mistaken because there does not seem to be any reliable measurements of Earth’s net Bond albedo. Currently I think that between 0.3 and 0.2 degrees of global cooling will occur between 2015 and 2025, judged by sea surface temperature. As I find new phenomena and new empirical constraints to add to the model, that could all change. We’ll find out the truth over the next 10 years, one way or another. I didnt see this coming,with Putin apparently on board along with the governing elite,in what they are planning this year in Paris. Amazing. If Monckton is right, forget sciene. Regardless of whether anyone believes in Man Made Global Warming, the UN will make a grab for world power by an unelected communist elite and this in Paris in December. Extremely worrying as they use their wealth to undermine conservative governments around the world. In Australia they will try to replace Tony Abbott with Malcolm Turnbull. Monckton is a keen observer with an insider’s view. This is terrible news. He thinks it is more than likely to happen. I doubt Turnbull will ever be PM. Looking around the usual sites ,I detect a harder line coming through ,it appears to me at least that the Dragon Slayers have been pretty much on line and constant for a number of years ,whilst the luke warmers are gradually becoming colder. The emphasis from CO2 maybe ,could be, might be causing a little warming to, CO2 is not the culprit appears to be taking hold in many more blogs. The accusation that luke warmers have served the alarmists by allowing that maybe CO2 was a minor contributor to global warming whilst there remains zero, zilch , de nada evidence that this is the case remains extant. 5 solar scientists give their opinions of what will/is happening, its dated Oct 2014 so is very much up to date. Even NASA are,today,worried about “the missing”magnetosphere. Is what many are longing to know. Like the Dalton’s two lows in a row. The Anthropogenic / Radiative / Catastrophic Greenhouse Effect may be in the process of being discredited but there is nonetheless a real Greenhouse Effect related to atmospheric mass. Note that sinking air (half the atmosphere at any given moment) warms at the dry adiabatic lapse rate as it descends. It is that warming on descent that dissipates clouds and results in clear skies. Those clear skies are similar to the clear glass roof of a greenhouse in that they let solar radiation reach the surface beneath. That warming on descent also reduces the rate of temperature decline with height which suppresses convection from the surface so that the surface then warms more than it otherwise would have done by virtue of the conductive exchange between air and surface. That is similar to the way that a greenhouse roof supresses convection and allows heat to increase beneath. All the total PE in a column is clearly not available for conversion to KE. Consider calm conditions at dawn. A uniformly stratified atmosphere stable with respect to vertical motion exists. Although the total PE is large none at all is available for conversion to KE. Yet the surface air temperature increases as the super quiet sun rises. Cloudy or clear. You are referring to short term inversion layers that temporarily insulate the column of descending warming air from the surface. There can be persistent cloud at the top of the inversion layer. Interestingly, it is that inversion layer that prevents the cold surface from cooling the descending air above the inversion during night and winter. That insulation helps to slow down cooling of the global atmosphere at night and in winter and so is a contributory factor in causing average global surface temperature to increase by 33C above that predicted from the S-B equation. As the sun rises and warms the surface the inversion layer disappears and then any subsequent uplift or descent is determined by whether there is a surface low pressure cell or a surface high pressure cell in control locally. No. Weather is often calm all day sunrise to sunset, no inversion layer. Straight normal lapse from surface T. The total PE is very large in that uniformly stratified atmospheric condition and none of the column PE is available to be converted to KE yet the near surface air temperature varies considerably up at sunrise then down toward sunset, cloudy or clear. As soon as temperature differentials arise in the horizontal plane then convection begins in the vertical plane unless an inversion layer is in place and even then it will occur up to the inversion layer. Only a tiny fraction of Earth’s atmosphere is calm at any given moment. How tiny? Backed by data source please, not imagined. In my calm day example – which happens often in our experience over large regions – there are no density variations in the horizontal at any column level. Suppose some energy is added in a restricted region of the column disturbing the stratification; horizontal density gradients appear and hence pressure forces are created that convert some of the total PE into KE. Suppose further, some energy is likewise subtracted; as a result of this removal the stratification is again disturbed and conversion of some total PE into KE is also possible. Removal of energy can be as effective as addition of energy in making more KE available. Lorenz discussed this as far back as 1955. In conditions of stable lapse, uniform stratification, no horizontal density gradients, the available PE is zero. Yet the large region daily surface calm air warms and cools with no KE converted from/to column total PE in clear and cloudy conditions even with a super quiet sun. Interesting, huh? How about you come up with numbers for totally calm air? Anyway, the level of solar activity that we are concerned with applies over decades and centuries and you are discussing daily variations within microclimates. Stephen W. 6:36am: Totally calm air extent? Sure. Watch the TV weather map or weather. com over Europe, Australia, US – you will spot large regions of calm air – the areas with relatively high width between isobars. You were discussing radiative effect being discredited so to discredit your comment, I’ve (Lorenz really) pointed out large calm surface regions where radiation not parcel KE determines surface air temperature during the day even with super quiet sun. Regions where there is not “sinking air…warms” as the total PE in the weather column on calm days remains unchanged per Lorenz pub. There really is credible physics in the 33K rGHE. I stand opposed to your 8:11pm radiative discredit comment. Realize too radiation always emits from mass. There is way more to climate than just ascending/descending parcels of your (incomplete) model. High pressure = sinking air rotating slowly as it descends. Low pressure = rising air rotating at a speed commensurate with the pressure decrease rotating as it rises. Calm areas are local, short lived and usually involve an inversion layer. Calm includes moving slowly. Smoke and cooling tower output rise vertically in calm weather many times observed & not short lived. Some define calm as less than 1 knot wind speed. In these conditions, the surface air temperature of large regions is not affected by column descending/ascending KE conversion to PE, radiation is the T driver – not considered in your model if that radiation varies as in super quiet sun. Causes you to miss rGHE effect. Surfaces cannot rise above S-B. Calm area “local” can be continental size, regional, inspect weather maps. Last for significant times driving surface T moving slowly about 1 knot. Globally measured – an important component of Tmedian measurments, not considered in your model of only rising/descending parcels. Your incomplete model can miss super quiet sun et. al. radiative variation cause/effect. Any movement is not ‘calm’. For practical purposes ‘calm’ can be defined at less than 1 knot but if the air is not completely stationary (it never can be on a rotsting sphere) then the principles that I described will apply. Not completely since the principles in your model are incomplete in that observed non-ascent/descent of parcels cannot explain the rise in temperature from dawn and the cooling to dusk on regionally large calm days nor the effects of a super quiet sun in the top post which are radiative in nature. This causes you to draw non-credible conclusions displayed in your physically inaccurate 8:11pm comment. I can follow most of what you say. In southern Australia high pressure systems are associated with gradually descending air and clear skies. Radiation gets through from the sun and warms the Earth so we generally have warm/hot days in Summer. The nights are often colder so presumably radiative Heat Loss is also greater in the absence of cloud cover. Now you say “That warming on descent also reduces the rate of temperature decline with height”, which I do not follow. The DALR is 9.8C/km, which is more than the typical environmantal lapse rate,except in the afternoon when the thermals are bubbling up. High pressures are often associated with a mid level inversion, but I do not understand what causes that. i) If the DALR is more than the typical environmental lapse rate then at every point on the descent the sinking air becomes warmer than the air around it. Thus, within the descending column the rate of decline of temperature with height is less than in the air around it. That inhibits upward convection from the surface beneath the descending column.You still get thermals bubbling up but they don’t go as high as they otherwise would. ii) The warming, descending air cannot always reach the surface. Colder, denser air beneath it will block the descent (an inversion). Additionally, hot thermals in the afternoon will hold it off the ground until the sun goes down again. Colder air can be advected in by winds from surrounding areas or can be caused by radiative cooling of the surface. If that warmed descending air cannot get to the surface then that prevents the surface from receiving energy (via conduction) from the descending air so that it can be radiated to space. A cool surface takes energy from the air above very effectively. Therefore, the inversion inhibits radiative loss to space and the warmed descending air cannot cool as effectively as it could have done if it had reached the surface. That helps to raise the global average surface temperature 33C above S-B. High pressure cells inhibit convection by day which allows the surface to warm above S-B. High pressure cells, by allowing inversions to develop, inhibit radiative coooling from the surface by night. The two processes combined explain why an atmosphere reduces day maxima and raises night minima for a rotating planet heated by a point source of energy. Those two processes also raise Earth’s average surface temperature 33C above S-B. The basic principles are all well known in meteorology but climatologists don’t know much meteorology and meteorologists don’t seem to have realisted the association with the S-B equation because heretofore they haven’t needed to. Actually, that isn’t quite right. There is a different explanation for that. High pressure cells only inhibit convection beneath themselves rather than preventing it globally so that although they allow the surface to get warmer locally and regionally during the day than it would have done with free convection the solid surface on the day side still doesn’t get as hot as that of a planet with no atmosphere due to the convection that does occur. Nor does the night side get as cold as that of a planet with no atmosphere because there are still regions where the warmed descending air can reach the surface without being obstructed by inversions. Oceans make the matter more complex than that but no need to go into that here. But still, it is the ascent and descent of air warmed by the surface that leads to the real Greenhouse Effect. Pressure does not affect convective heat transfers, if that’s what you mean when you use the word “convection” though perhaps you have your own definition other than what is used in physics. Either way, prove your statement using the Kinetic Theory of Gases, or stop promulgating such nonsense. Pressure in itself does nothing. Descending air within high pressure cells (downward convection) warms at the dry adiabatic lapse rate as it descends. That is what inhibits convection from the surface. When there is no sun shining at night it is highly improbable that there is much descending air except that caused by wind. If it is wind, then it does not get significantly warmed just because it is descending. We see this atthe South Pole where strong descending winds merely convey the cold air from the upper troposphere to the surface without significant warming of that air or the surface. And why would inversions “obstruct” when it is in an inversion that we actually do get downward convective heat transfer? You are not qualified in physics, and your understanding of thermodynamics is mistake Stephen. You only make a fool of yourself dabbling in such and I will continue to expose your errors as long as I live. There are high pressure cells on the night side. They are all comprised if descending columns of air. An inversion prevents both downward and upward convection. At the poles the tropopause height is lower so the air doesn’t warm as much on the descent as it would at the equator and the lack of insolation at the surface allows the surface to cool by radiation to space well enough to partly negate the warming effect of the descending air. I feel that you are making some progress here. Understanding moves forward in small steps sometimes. I will re-read all this exchange a few times. With regard to Doug’s assertion that air at the poles does not warm toward the surface, I checked the Aerological Diagram for Casey station in Antarctica for last night. The tropopause is at 28,000ft and below that the air gets warmer all the way down to the surface. This is all stuff that I had assumed was clear to others such that I never previously (over a period of 50 years) had to articulate it in a way that people unfamiliar to meteorology could appreciate. The expression of reality in simple conceptual terms is as much a journey for me as it is for readers such as yourself and of course I make errors along the way but I’m sure I am getting there now. Over time I am progressively refining my terms of expression and IMHO getting progressively closer to the truth which is completely unpalatable for those who has based their world view on the flawed CO2 narrative. I respect Doug for having a go but he must also recognise where he loses touch with the basic physics if he is to retain that respect. Well Stephen the nominal troposphere of the planet Uranus also has a temperature gradient equal to about 95% of the -g/Cp value. But the only warming that can be done by solar radiation raises the methane layer near TOA to a very cold 59K, that being about the effective radiating temperature of the planet. However, at the base of that troposphere, it’s 320K and yet there’s no surface, so how does the convective heat transfer actually transfer energy downwards so that the whole planet does not just cool off, as it would if the Sun stopped shining? Silent readers can read the answer here: here. It works perfectly well for any gaseous planet. As gases fall towards the centre of gravity they are compressed and gravitational potential energy becomes kinetic energy. The mass of the gases around Uranus therefore produces a temperature of 320K at the base of its ‘troposphere’. For planets it helps if you have insolation from a nearby sun to provide fuel for the initial commencement of convective overturning but for huge gas clouds in space one doesn’t even need that. Do you say that the cosmic background at 3K heats the outside of a gas cloud in space and that heat then diffuses inwards to start a new sun at the centre? The truth is that any gas molecule floating in space has a huge gravitational potential energy related to its distance from the centre of gravity of the universe. Its kinetic energy however is miniscule at 3k. Then, as that molecule is drawn towards a local centre of gravity (often provided by a nearby planet or cloud of gas) more and more of its gravitational potential energy is converted to kinetic energy and its temperature rises. What is being overlooked is that any inocuous little gas molecule floating in space at 3K is actually carrying a huge amount of gravitational potential energy which it acquired as it travelled outward against gravity from the big bang at the start of the universe. Local gravitational fields then unlock part of that energy by converting it to kinetic energy which manifests as heat. I don’t understand why you weote, “forget science”. Maybe we should contact the BOM and ask them to normalize the data for 1932-2008(and earlier if required), so that the facts are consistent with the story. How about that? I think the silence is self explanatory in both cases. May I recommend ‘The Cold Sun’ by John L. Casey published by Trafford in 2011. Climate skepticism as a philosophy is tactically dead, as rigorous proofs are NOT acknowledged by the adversary. We’re now necessarily in the era of cynicism (since corrupt judges closed the door on skepticism by intransigently refusing to acknowledge 1+1=2). Being cynical about human politics while deeply appreciating & understanding nature is NOT contradictory. I suggest we endeavor to be happy, healthy, harmonious cynics who steadfastly refuse to get sucked into endlessly wasting time debating dark agents who have never and will never acknowledge 1+1=2. The sun governs terrestrial climate. When you realize that AGW is “agenda” driven and not science driven, it is far more understandable why the “warmists” do not change their song. They can’t. It isn’t about science. It isn’t about the climate. It IS about the agenda they have signed on to. That agenda is the “green” agenda of limited population and lowered overall levels of civilization – themselves, of course, being excluded from the lowered standard of living. This is why all the data and all the “proof to the contrary” has no affect on them. It is NOT about science and the climate after all, it IS about the “green” agenda. It is NOT about the redistribution of wealth, it IS about the “GREEN” agenda. We need to confront the “agenda,” and if the push back against the agenda is successful, AGW will fade into history as just another crackpot theory that can’t be scientifically supported. They’ve got too much support Tom. They’re unstoppable (in the current era). Fiction sells. The best we can hope for (in the current context, which appears assured to last for generations) is to be allowed to publicly state the truth about sun-climate relations without being harassed for doing so. They will never admit 1+1=2. I recommend that we focus on acquiring the right to state 1+1=2 without being harassed for doing so. Aside from the exception of a select few enlightened venues, we patently don’t have that right today. Miles, M.W. ; Divine, D.V. ; Furevik, T.; Jansen, E.; Moros, M.; & Ogilvie, A.E.J. (2014). A signal of persistent Atlantic multidecadal variability in Arctic sea ice. Geophysical Research Letters 41, 463-469. Martin Miles’ research group has done an extremely valuable job of gathering all of these records together. Please see their Table 1 & Figure 1. Dr. Habibullo I. Abdussamatov: Russian Academy of Scientists. Head of space research at the Pulkova Observatory, St. Petersburg. In North America we had some heavy vortex action so far this winter season with temps 30F (about 17C) or more below normal for a few weeks.